In space, no one can hear you play the harp. 3 3/4-inch scale action figure of Amy Farrah Fowler from The Big Bang Theory! Amy cosplaying in a blue Starfleet Sciences uniform! Figure has 5 points of articulation. Includes accessories and pop-out diorama packaging. Each limited edition The Big Bang Theory variant figure package is numbered! Dr. Amy Farrah Fowler doesn't just have brains, she likes to study them too! 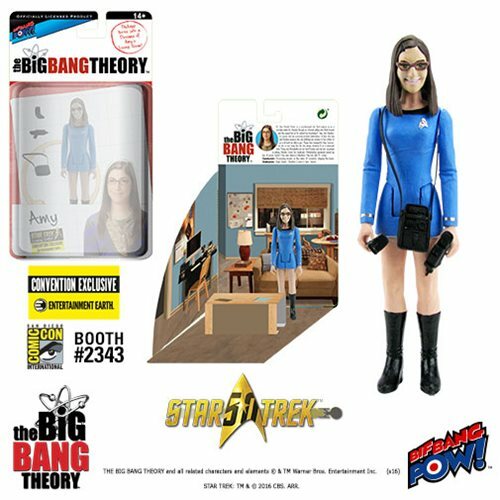 That makes The Big Bang Theory's resident neurobiologist the perfect choice to wear a Starfleet Sciences officer uniform with this special edition The Big Bang Theory / Star Trek: The Original Series 3 3/4 scale cosplay figure made exclusively by Bif Bang Pow! This meticulously rendered figure presents Sheldon's "girlfriend" sporting her moniker eye-glasses and wearing a classic blue Starfleet Sciences uniform with the infamous knee-high black boots. Also included are a communicator, phaser and tricorder. Amy cosplaying in a blue Starfleet Sciences uniform features 5 points of articulation, including: neck, shoulders and hips. As an added bonus, the individually numbered packaging unfolds into a pop-out diorama of a unique location from the series. Plus as an Entertainment Earth Convention Exclusive, each figure in individually numbered with a holographic sticker - only 2280 produced! Ages 14 and up. Dr. Amy Farrah Fowler – is a neurobiologist who first popped up as a possible match for Sheldon through an Internet dating site (that Howard and Raj signed him up for without his knowledge!) Amy, like Sheldon, is a genius who has previously avoided relationships. In fact, she only met Sheldon because she was fulfilling her promise to her mother to go on at least one date a year. Things have changed for Amy, however, as she is now living the life she always dreamed of as a pubescent teen. Penny and Bernadette are her best friends and she has succeeded in making Sheldon Cooper her boyfriend. ("Relationship Agreement" penned by him, of course. Swoon!) She even shared a Valentine's Day kiss with Dr. Cooper. Weaknesses: High libido, Sheldon Cooper's lips, tiaras.